Mr. Blackford, the store owner, has been happily storing products in the simple terminal application you set up. However, as he adds more products to the store, it becomes harder to browse through them to find a specific one. It would be great if there was a way to organize the products into categories. Note: if the Rails console is still running, exit it with Ctrl-C before entering the above command. 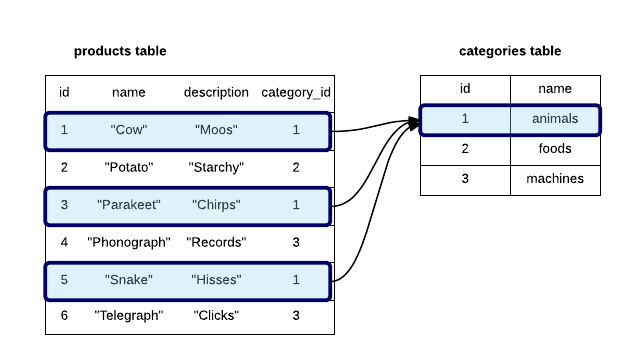 Databases are powerful because they let you connect different tables of data with each other. For example, we can easily classify products into categories. Q: How can we classify the products into categories? A: We need to identify each product with the category it belongs to. Let's add a new column category_id to products to mark the category of each product. Q: How can we get a list of all products in a specific category? A: Simple. We just ask the computer to go through all the products and return the ones that belong to the category we want. For example, if we wanted the products in category 1, the computer would go through the database and return the products where the category_id is 1. Q: Will we need to write SQL to get this information? A: No, Rails makes it easy for us. We just need to setup the columns and tell Rails about them. The type specifies what data will be stored in the column, such as text or integer data. Once you've created the migration file, run rake db:migrate to add the column to the database.